After Notre Dame we had some free time in Paris!! While we split into groups everyone visited the Louvre. 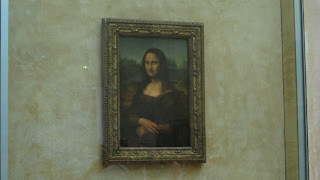 A ENORMOUS museum featuring more than 35,000 pieces in its collection - including the Mona Lisa! This painting was a gift to Louis XIV from da Vinci upon his death and was housed at Versailles for years and is now part of the Louvre's permanent collection. The crowds here were the biggest! Another highlight was seeing the Venus de Milo! There's no way we could have seen everything - but everything we saw was beautiful! Other free time activities included stopping by the Shakespeare and Co. Bookshop, shopping on the Champs Elysees, and some great dinners. We even saw some of Paris by night!! Another great day!